Mexican is one of my favorite cuisines. I love everything about it, the colors, the flavors and the versatility. One of my favorite side dishes to make when I am serving fajita (and I don’t have any avocados to make guacamole) is this colorful salsa. The garlic in the background sets the tone while the corn and beans adds texture, the parsley adds color and freshness and the lemon juice ties the whole thing together.I usually add a chopped red onion to the salsa but on this particular day I didn’t have any and it still tasted great. If you are not big on garlic a little trick you can do to get a little garlic taste in your salsa but not too much is to rub your cutting board with a clove before you chop the tomatoes, this will infuse the salsa with a mild garlic taste without an garlic being actually in it. Before I leave with the recipe I would like to thank sweet Manu from Manu’s Menu for passing me the versatile blogger award. The award comes with 2 conditions,pass it on to other wonderful bloggers and share 7 things the readers don’t know about you. Although I have already shared 7 things you don’t know about me here , but today I thought 7 more won’t hurt lol. 1. I was born in october, maybe that is why I find autumn, apples and cloudy mornings comforting. 2. My name “Sawsan” is arabic for the name of the iris flower. 3. I am a very harsh critic when it comes to my own work, you can call me a perfectionist but sometimes I can go over board. 4. I love tea, Morrocan mint green tea is my favorite nowadays. Mix the corn,beans, tomatoes, onion, garlic and parsely. Add the olive oil, lemon juice and salt. Posted in Uncategorized and tagged blog award, corn and bean salsa, mexican side dish, postaweek2011, recipe, salsa, what to serve with fajitas. Bookmark the permalink. Mmm, very tastey and fresh salsa, thank you Sawsan. You know what, I’m not surprised with your drawings since I know that your photoshop designs you used to make in laki were really wonderful, so it make since you are a good painter too. I also have something to add to your personality, if you would let me please, you have a great personality Sawsan and you’ll never hesitate to answer any help or request, ma shaa allah, so thank you, thank you, thank you. Thank you so much for passing this award on to me! Your drawings are so good! I find people extremely hard to draw so I am always impressed by those who do it well. Congrats on your award! Well deserved. This recipe looks great. We love salsa! you are most welcome Dee..you deserve it 🙂 I love your blog! Congrats on the award, well deserved. Good picks to pass it onto too! Love the salsa! I never thought of putting beans in salsa. Looks amazing! Nice to learn allt hose new things about you! Thank you for passing on the award Sawsan! 🙂 And congratulations on receiving it. 🙂 I love salsas as well. This looks like a great version. The last several I have made have been very summer oriented, but this one would work well in the fall too. And for us – the more garlic the better. Yum! You are most welcome..I love your blog! I adore Mexican food too — they say you eat with your eyes first, and Mexican cuisine is sure a testament to that. Also, it helps that I LOVE cilantro! I love your recipe for a bean and corn salsa. I just did a post on Mexican Meatloaf and this would go so well with it. We are both in a Mexican frame of mind. Sounds like a nice combo. Also I’m completely flattered to be included on your list for the versatile blogger award. Thank you so much!!! Always fun to learn about about people! You have wonderful drawings! Hard to fit in that with work, blogging, family, and everything – but keep it up they are great! A very well deserved award….You are amazing…I do too absolutely love Mexican Food. This salsa looks BUENISIMA!!! I am totally flattered and honored to be included in your list!!! OMG…many many thanks!!!! What a hearty salsa! I love that it has both beans & corn. Thank you so much for passing me the Versatile Blogger Award. That was very kind of you, as was your mentioning my blog on Facebook. (I am very new to Facebook and have yet to learn its ins-and-outs.) Again, thank you very much. Hi Sawsan! Your “perfectionist” work is easily seen on your blog, your beautiful food and photography, and even drawing!!! 😉 I love salsa that has beans in it. It’s a great side dish not just a dip. Congrats on the award and now you made me very curious about Moroccan mint tea.. I love tea too! 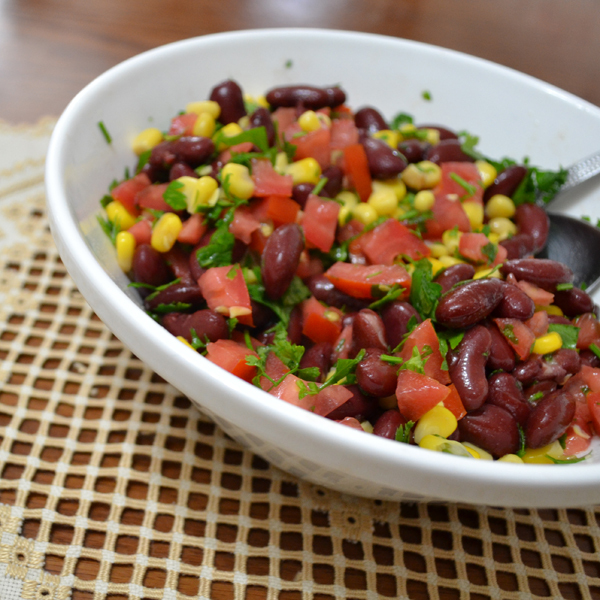 What a hearty, colourful salsa, love that you add kidney beans to it! I love mexican food as well! Your drawings are beautiful, so alive, and it would be wonderful if you give us a chance to see more of your works! Congratulations on your Award! Well deserved! Thank you for the award! That’s made my day. 🙂 You’re a very well earned recipient of the award yourself. And your sketchers above are really fantastic, I hope you’re still pursuing it. And now, wouldn’t you know, I’m off to make guacamole with the recipe you linked to above. Well timed!! My mother if feeling better and I can get back to a normal life again, just need to catch up now! Again thank you for the truly amazing gift! I was actually wondering about your profile picture,it is so delicate and beautiful..I expected it to be your work especially after seeing your pictures..they are clearly ones caught by the eye of an artist..